Sometimes a chemical formula is complicated by being written as a condensed formula (or condensed molecular formula, occasionally called a “semi-structural formula”), which conveys additional information about the particular ways in which the atoms are chemically bonded together, either in covalent bonds, ionic bonds, or various combinations of these types. This is possible if the relevant bonding is easy to show in one dimension. An example is the condensed molecular/chemical formula for ethanol, which is CH3-CH2-OH or CH3CH2OH. However, even a condensed chemical formula is necessarily limited in its ability to show complex bonding relationships between atoms, especially atoms that have bonds to four or more different substituents. Chemical formulas as described here are distinct from the far more complex chemical systematic names that are used in various systems of chemical nomenclature. For example, one systematic name for glucose is (2R,3S,4R,5R)-2,3,4,5,6-pentahydroxyhexanal. This name, interpreted by the rules behind it, fully specifies glucose’s structural formula, but the name is not a chemical formula as usually understood, and uses terms and words not used in chemical formulas. Such names, unlike basic formulas, may be able to represent full structural formulas without graphs. Molecules with multiple functional groups that are the same may be expressed by enclosing the repeated group in round brackets. For example, isobutane may be written (CH3)3CH. This condensed structural formula implies a different connectivity from other molecules that can be formed using the same atoms in the same proportions (isomers). The formula (CH3)3CH implies a central carbon atom connected to one hydrogen atom and three CH3 groups. The same number of atoms of each element (10 hydrogens and 4 carbons, or C4H10) may be used to make a straight chain molecule, n–butane: CH3CH2CH2CH3. For ions, the charge on a particular atom may be denoted with a right-hand superscript. For example, Na+, or Cu2+. The total charge on a charged molecule or a polyatomic ion may also be shown in this way. For example: H3O+ or SO42−. Note that + and – are used in place of +1 and -1, respectively. The @ symbol (at sign) indicates an atom or molecule trapped inside a cage but not chemically bound to it. For example, a buckminsterfullerene (C60) with an atom (M) would simply be represented as MC60 regardless of whether M was inside the fullerene without chemical bonding or outside, bound to one of the carbon atoms. Using the @ symbol, this would be denoted M@C60 if M was inside the carbon network. A non-fullerene example is [As@Ni12As20]3−, an ion in which one As atom is trapped in a cage formed by the other 32 atoms. 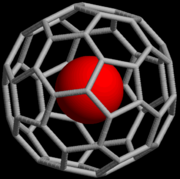 This notation was proposed in 1991 with the discovery of fullerene cages (endohedral fullerenes), which can trap atoms such as La to form, for example, La@C60 or La@C82. The choice of the symbol has been explained by the authors as being concise, readily printed and transmitted electronically (the at sign is included in ASCII, which most modern character encoding schemes are based on), and the visual aspects suggesting the structure of an endohedral fullerene. A list of formulas in Hill system order is arranged alphabetically, as above, with single-letter elements coming before two-letter symbols when the symbols begin with the same letter (so “B” comes before “Be”, which comes before “Br”). ^ “Law of Constant Composition”. Everything Math and Science. SIYAVULA. Retrieved 31 March 2016. This material is available under a Creative Commons Attribution-Share Alike 3.0 license. ^ Chai, Yan; Guo, Ting; Jin, Changming; Haufler, Robert E.; Chibante, L. P. Felipe; Fure, Jan; Wang, Lihong; Alford, J. Michael; Smalley, Richard E. (1991). “Fullerenes wlth Metals Inside”. Journal of Physical Chemistry. 95 (20): 7564–7568. doi:10.1021/j100173a002. ^ Edwin A. Hill (1900). “On a system of indexing chemical literature; Adopted by the Classification Division of the U.S. Patent Office”. J. Am. Chem. Soc. 22 (8): 478–494. doi:10.1021/ja02046a005. Petrucci, Ralph H.; Harwood, William S.; Herring, F. Geoffrey (2002). “3”. General chemistry: principles and modern applications (8th ed.). Upper Saddle River, N.J: Prentice Hall. ISBN 978-0-13-014329-7. LCCN 2001032331. OCLC 46872308.